From the Café del Mar ensconced on the walls of the old city, a fading sun imprinted with tinges of soft alluring colors as if on loan from a street artists pallet bids farewell to Cartagena, slowly disappearing below the horizon, casting long shadows across a rippling Southern Caribbean Sea, and leaving behind a cool essence of shadowy colonial street lights. Below, the cadence of horse hoofs on narrow cobblestone streets sets the tone for this historic city, opening a window to another world. Beneath a brilliant star-filled sky a sense of rhythm and dance permeates the old walled city mingling with romance and laughter and the sounds of Afro-Columbian folk songs, meringues, salsa, reggaeton, cumbia, and champeta, performed by Costenos or coastal musicians. Lovers linger over candle-lit tables and tall iced drinks, eyes locked, while a gusty sea breeze lends a hand to establish the setting, along with strolling musicians who can sing up a storm. Colombia, long noted among the world’s most musically oriented countries, is home to an astonishing number of music and dance festivals, in addition to the second largest carnival in all South America, after Rio de Janeiro. Every town and village seems to have someone who can play the guitar and sing. The Cartagenians agree, often professing that music and dance are etched into their DNA. 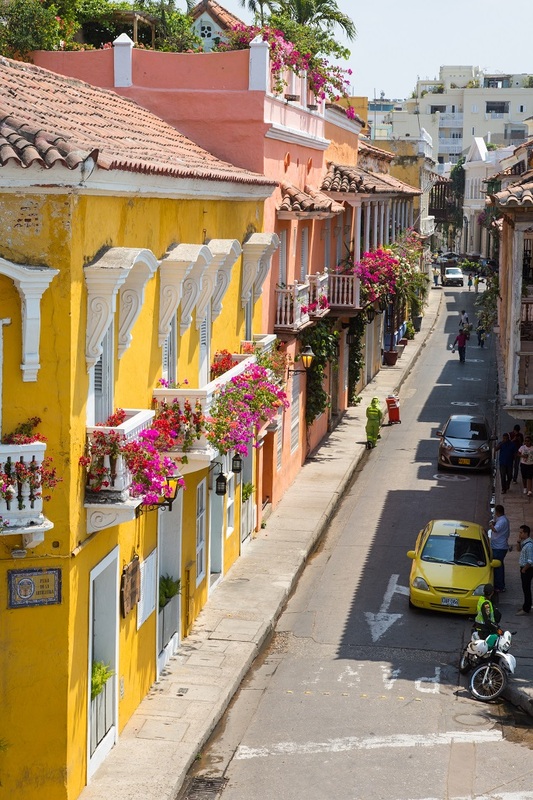 Designated a UNESCO world heritage site in 1984, Cartagena’s old town is lost in time, a gem as bright as the treasured Columbian emeralds, which stirs the senses with a maze of garland decorated balconies and tidy stone streets laid out by the Spaniards. Horse-drawn carriages clop through the town, annoying a gaggle of cabs that dart about like a swarm of frustrated bees. 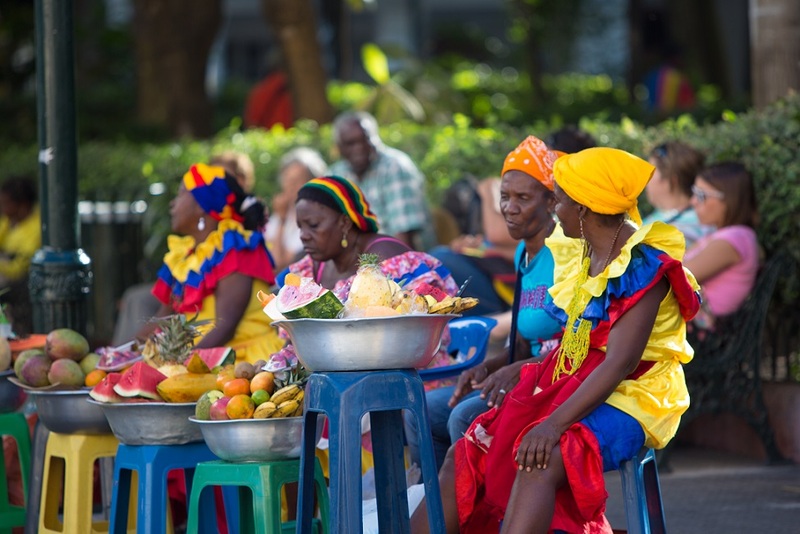 Celebrated for their ornate cathedrals and churches, Cartagena’s plazas are lined with busy sidewalk cafes where talented guitarists move among the tables eager to serenade diners, while colorful food carts offer a quick taste for those on the run. Plaza Santo Domingo, the heart and soul of old town, holds one of world-renowned Colombian artist Fernando Botero’s large bronze sculptures, La Gordita, honoring women with proud unending curves, and serving as an endearing “good luck” photo option for visitors. Countless street vendors, not yet pushy but learning clever dialogue, all offering the “lowest prices”, sell silver and amber jewelry, hand-woven purses, coconut spoons and bowls, fruit on a stick, lottery tickets, cigars, hats, and t-shirts on the sidewalks in front of high-end fashion boutiques, allowed to post only a small sign, no neon or high rise monstrosities. 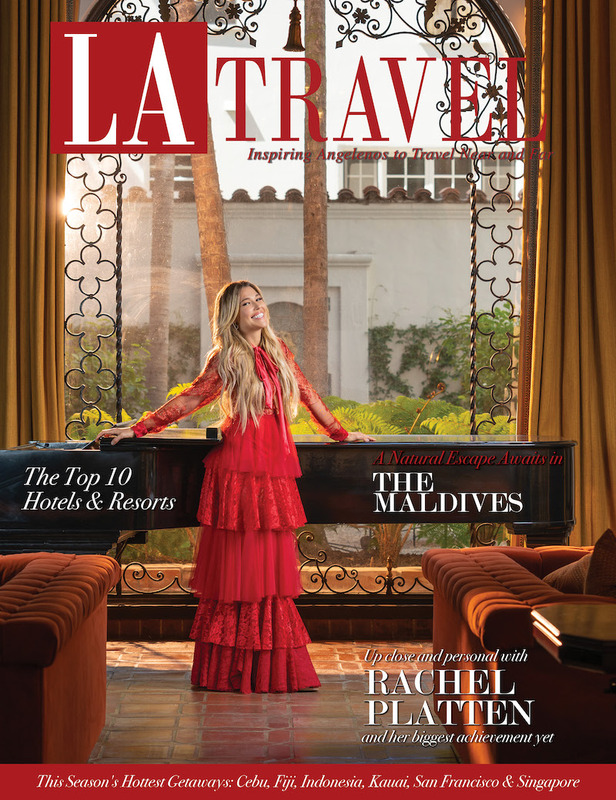 Respecting the UNESCO guidelines, monasteries, convents and large private homes have been converted to intimate hotels and restaurants, while vigilantly retaining their original character. Of note is the Charleston Santa Teresa Hotel, which in 1609 was a convent for the Carmelite Nuns. 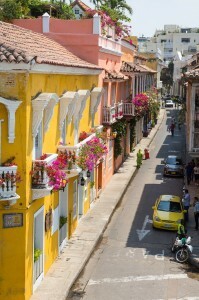 Throughout history Cartagena has been like a juicy mango ready to be plucked. In 1533 the Spaniards sailed in and fortified the city by completely enclosing it with a thick wall complete with sentry towers and canons, which are intact today and remain the site of many a stormy tale. The early 16th century was an era of fierce confrontation and hostilities, therefore a few years later the Spaniards began constructing the massive Castillo de San Felipe Barajas on San Lazaro Hill, which dominates approaches to the city by land or sea. Overlooking the landscape with steep-angled passageways and a maze of tunnels and armaments, this largest Spanish fortress in the Americas suffered frequent attacks by troubling galleons of crusty rag-tag pirates, as well as French and English ships looking for a foothold in the Spanish controlled South American continent. Heroic Simon Bolivar, Colombia’s version of George Washington, played a key role in Latin America’s successful struggle for independence from the Spanish Empire, putting the Spanish flag forever to rest in Colombia. The old weathered walls and fortress are more than a symbol of colonial history. Park-like Plaza Bolivar with strolling street musicians, a sparkling fountain, and a place to relax and people watch have honored Libertador Bolivar with a statue of him riding triumphantly on his horse. 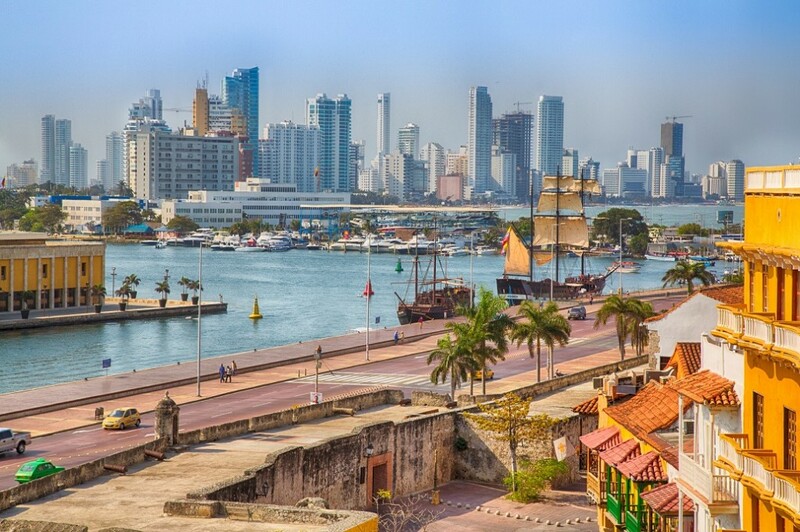 A cathedral, the Palace of the Inquisition and a gold museum, surrounds plaza Bolivar, along with some of Cartagena’s most striking buildings. The residents, proud of their revered city, are eager to share it with the world. Cab drivers asked the question, “What is Colombia all about?” will often answer, “Coffee and beautiful women.” This might be true but on the horizon beyond the bay, the new cityscape looms skyward radiating hope and prosperity, and speaks of business interests expanding beyond coffee. A country in transition, modern cruise ships calling on Cartagena are still greeted by a statue of the Virgin of Carmen, patron saint of seafarers, as they arrive in the bay. A large harbor anchoring yachts, sailboats, and tour and party vessels is just outside the main entrance to old town near the Clock Tower and Plaza de Los Coches. 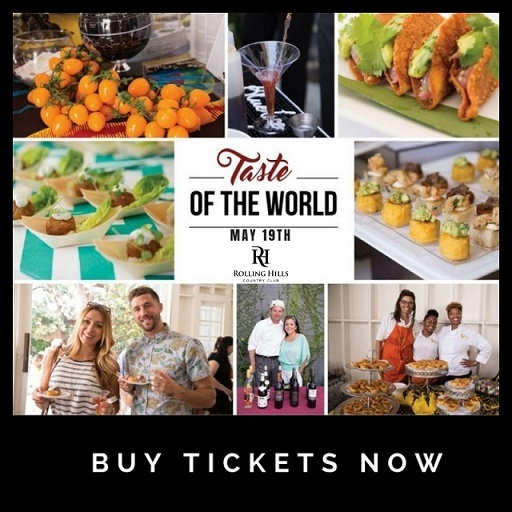 The three hundred year architectural difference between the old city and the new is eye-catching as modern high-rise hotels pop up along with office buildings, restaurants, a convention center, and nightclubs in Boca Grande where the Latin groove swings late into the night. But within the walls another day is put to bed as the sun sets on four and a half centuries of well-preserved history. 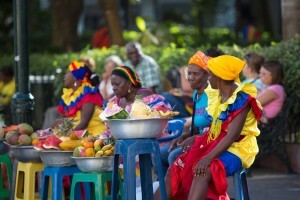 This entry was posted in Central & South America and tagged cartagena, columbia, culture, south america, travel.